80 watt Hi-Intensity LED work light. This is the COMPLETE factory package. Call to see a demonstration in our Dallas Showroom. The CB-29 is a unique machine that is fed entirely by the presser foot, which revolves in a full 360º circle. 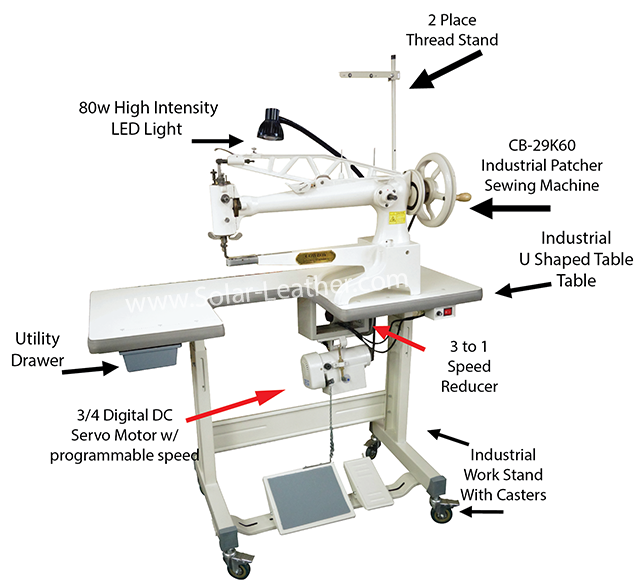 This machine can be used to repair stitching and tears in shoe and boot uppers or for sewing decorative patches onto garments, like leather vests. It is capable of sewing up to 5/16" of light to medium weight leather, with up to #138 bonded nylon or polyester thread. The CB-29 has a narrow cylinder arm of either 12 or 18 inches in length; making it ideal for sewing boots, round cases, bags, purses and hats. This machine features a double ended needle plate, with small & large holes. Repair stitching and tears in shoe and boot uppers, sewing decorative patches onto garments, like leather vests boots, round cases, bags, purses and hats.